Academic Article: Overtraining: Generic principles for sport. Overtraining is a concept that has been around in the literature for many years, it has been termed burnout, staleness, failure, or chronic fatigue (Joyce and Lewindon, 2014; Gamble, 2013; Kreher and Schwartz, 2012; Hoffman, 2012; Cardinale at al, 2011). Lehmann et al (1993) outlined overtraining as ‘an imbalance between training and recovery, exercise and exercise capacity, stress and stress tolerance’. This clearly shows that the concept of overtraining is making the athlete work beyond their current actual or perceived capabilities, and involves a number of key factors. It has been described as a problem of capacity, where the stress placed on an athlete both internal and external to the sport setting outweighs their ability to cope wit it. (Kentta and Hassmen, 1998; Halson and Jaukendrup, 2004; Kreher and Schwartz, 2012). This is an issue of increasing importance as modern athletes are being pushed into training at ever increasing volumes and intensities, heightening the importance of an effective recovery system (Kentta and Hassmen, 1998). There is a fine line in coaching science where by the coach has to periodise training to elicit a training response that places their athlete in a position where they can compete at their chosen level, however this is off set by the need for adequate recovery in order to prevent overtraining. Recovery can be a under rated aspect of the training programme as many coaches and athletes tend to observe the more is better, and are very conscious of any days where they have missed training sessions. Lehmann et al (1993) established that the actual boundary between a training load that will lead to adaptation and a load that will lead to overtraining is a fluid thing and may be effected by training variables but also by factors beyond the coaches control such as stress in the athletes home life. This shows how overtraining is a holistic subject with many aspects of the athletes life coming into play in terms of their susceptibility to this condition. This barrier is always fluid and moving so at times the athlete may be able to cope with a larger amount of physiological and psychological stress than at other points in their training career (Kentta and Hassmen, 1998). Working in and around overtraining thresholds can be a difficult thing to do as there may be un-predictable outcomes, especially with shorter coach-athlete relationships where the coach has not managed to set a baseline from which to judge altered mood states (Urhausen and Kindermann, 2002). Defining overtraining has been a point of some contention and conflict within the literature as there is no specific and widely accepted definition of overtraining, but many of the definitions have a common theme in terms of the duration of short or long terms decreases in performance (Fry and Morton, 1991; Halson and Jeukendrup, 2004; Rearick et al, 2011; and Carfagno and Hendrix, 2014). Kreher and Schwartz (2012) looked at the concept of overreaching as a phase in training where there was a short term loss of performance, this would then require a period of between days and weeks for recovery. This period of overreaching has also been identified as an important stimulus in order to prompt physiological developments, termed supercompensation (Lehmann et al, 1993). This is however where the possible issue may lie, in that in order to get growth and development that will lead to an increased level of performance there is a need for an athlete to push themselves beyond there usual levels of volume and intensity. This has been termed functional overreaching (FO) and is considered a positive aspect of training. There is however then a point where this overreaching becomes something more serious that in turn effects long term performance. If overtraining is chronic and possibly added to by stressors outside of the sporting environment then it becomes classed as non-functional overreaching (NFO) and hence a negative position to be in. Carfagno and Hendrix (2014) identified that NFO is most often the result of repeated bouts of FO with inadequate rest periods. If NFO then persists an athlete moves into a position where they require long term recovery, so periods of training are followed by a period of decreased performance of greater than several weeks to months, with a figure of greater than two months being set by the ECSS (2006), as overtraining syndrome (OTS). This would be considered a negative position for an athlete to be in as they would be unable to perform at their potential for some period of time. These definitions have been based solely on time to recovery rather than the number of symptoms or the severity of the symptoms that the athlete may experience (Kreher and Schwartz, 2012). Urhausen and Kindermann (2002) defined OTS as sports specific decreases in performance coupled with an altered mood state, and this has formed the basis of detection of the condition. Initially however before any investigations into the possibility of an athlete having OTS an adequately trained sports medicine doctor should screen the athlete for any form of illness or disease, which could be the underlying reason for the symptoms being presented. If the athlete is clear of illness then a diagnosis of OTS could be sought. Testing procedures should be initiated after a two-day rest period (Urhausen and Kindermann, 2002); this ensures that the lowered performance is not part of FO and the supercompensation process. There have been many signs and symptoms commonly observed in athletes with OTS, these are split down into three distinctive categories by (Israel, 1976; Stone et al, 1991; Lehmann et al, 1993; Halson and Jeukendrup, 2004; Kreher and Schwartz, 2012). They have placed these into parasympathetic symptoms of inhibition and depression such as fatigue, depression, bradycardia and loss of motivation. Sympathetic alterations defined as restlessness and excitation such as insomnia, irritability, agitation, tachycardia, hypertension and restlessness. Then finally an other category including anorexia, weight loss, lack of concentration, and anxiety. Parasympathetic fatigue is more commonly seen in aerobic; endurance based sports, and is seen as possibly more advanced form of OTS (Halson and Jeukendrup, 2004; and Cafagno and Hendrix, 2014). 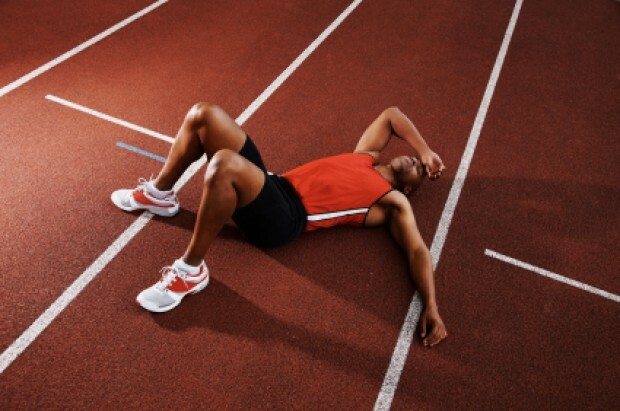 Some studies also indicate that sympathetic fatigue is seen more in anaerobic sports or as a precursor to parasympathetic fatigue symptoms (Kentta and Hassmen, 1998). There are a number of procedures that have been investigated to help with the diagnosis and identification of overtraining syndrome. These can be split down in to a series of tests that may be more accessible to most coaching settings and some that would require the availability of sport science support. One of the simpler predictors of OTS is heart rate, there have bee reports that increased heart rate at rest or sub-maximally may be linked to OTS (Stone et al, 1991), this however may be a sign of infectious disease or glycogen depletion. There have also been studies that have shown that overtraining athletes maximum hearth rate tends to reduce, which could be identified by a stress testing procedure (Lehmann et al, 1992; Anyder et al 1995; and Urhausen et al 1998). Urhausen and Kindermann (2002) discussed the use of ergometry to help diagnose OTS by having an athlete a ‘stress test’ performed at 10% above the athlete’s anaerobic threshold, and a reduced performance in this test has a correlation to OTS. Mood state has been used very accurately to help to identify OTS (Stone et al 1991; Urhausen and Kindermann, 2002; Rearik et al, 2011; and Kreher and Schwartz, 2014) utilising the POMS scale. Slivka (2010) discussed that there was commonly a deterioration in mood state prior to a drop in performance. With much of the literature supporting that there would be a dip in mood state prior to a dip in performance this is an important aspect of the screening process (Kellerman, 2002). The use of these tests or the RESTQ-Sport test on a regular basis can be highly effective in helping a coach to identify alterations in mood, allowing early action to be taken. The RESTQ-Sport test also takes into account both internal and external stressors to the sport, it can be more accurate than the POMS test (Rearick et al, 2011). These tests however may be effected by the athletes perception of changes the coach may make based on the answers to this questionnaire, leading to more positive and less accurate results. The use of the above three tests are cost effective to administer and coaches can be trained to interperate the results. This makes them much more accessible in the diagnosis of OTS at lower levels or with youth sport where the financial cost may be more of a deciding factor as to whether a protocol is utilised. Additionally at lower levels the coach may not have the same quality of sports science support making interpretation of results of some tests less meaningful. If sports science support is available then Kindermann (1986) looked at the connection between athlete who suffer with OTS and maximum blood lactate levels as a possible identifying marker of this condition. However this test has been identified as not being sensitive enough by Carfagno and Hendrix (2014) for use as a primary method of diagnosis. Additionally the use of measurement of creatine kinase has been used, as creatine kinase actively mirrors physical activity levels, but has not be identified as an accurate predictor of OTS (Urhausen and Kindermann, 2002). No matter if using the more sports science lead or coach led approaches detailed above they both require that there is a baseline set and regular testing is carried out. This is vital to early detection of NFO or OTS, from data generated throughout the season. By having reliable and regular data to form a baseline allows easier identification of any potential drops in performance. For example if looking at a maximal heart rate test, if a coach is unaware of what their athletes maximal heart rate is normally they will find it hard to make judgments of if thee has been a deviation and by how much. With the establishment of tests and screening procedures for OTS still being in the early stages of availability and the fact that many of the methods discussed above have flaws thank may make them less accurate, with many studies based on small populations. It is important that judgments made regarding the diagnosis of OTS are not made based on the outcome of a single test. Coaches should take a holistic approach to the diagnosis of this condition and use triangulation of test results to improve accuracy. The treatment of OTS can vary form athlete to athlete as each will present with a different set of symptoms. This leads to the need for the development of an individual treatment plan that will help them to return to optimal performance and find the athletes homeostasis (Kentta and Hassmen, 1998; Kellermann, 2002; Kreher and Schwartz, 2012; Carfagno and Hendrix, 2014). The key feature of most treatment plans will be the use of active recovery or complete rest, with Kentta and Hassmen (1998) stating that rest was the best form of treatment for OTS. There many also be a need for medication as prescribed by a sports science doctor to assist with symptoms such as depression or sleeplessness. Relaxation and emotional support including the teaching of the athlete coping strategies to aid them dealing with the stressors both inside and outside the sport. Carfagno and Hendrx (2014) also discussed besides the need for rest there many be a need for nutritional support with athletes with a higher carbohydrate diet being less likely to suffer with OTS and the possibility that increased carbohydrate consumption may speed the recovery process. Coaches should see unexpected poor performance as an indicator of the need for screening for OTS as many coaches work athletes harder after a poor performance (Lehmann et al, 1993). This can only be effectively identified once a coach has a detailed array of information in terms of baselines and histories from the athlete. There is however a possible difficulty for a coach with less available resources to take such a holistic approach and the use of a limited number of indicators being used. It is however vital that the coach starts to learn who their athletes are and as well as the use of the indicators discussed above they start to understand what kind of stress levels individual athletes can bear and what are their individual warning signs of NFO. If this can be caught early and used to manipulate training variables it will lead to much more effective periodization as opposed to a player that is not monitored effectively and slips into OTS. Baechile, T. and Earle, R. (2008) Essentials of strength training and conditioning. 3rd Ed., Leeds: Human Kinetics. Cardinale, M., Newton, R. and Nosaka, K. (2011) Strength and conditioning: Biological principles and practical applications. Chichester: John Wiley and Sons Ltd.
Carfagno, D. and Hendrix, J. (2014) ‘Overtraining syndrome in the athlete: Current clinical practice’. Current Sports Medicine Reports. 13(1) pp. 45-51. Fry, R. and Morton, A. (1991) ‘Overtraining in athletes: An update’. Sports Medicine. 12(1) pp. 32-65. Gabriel, H., Urhausen, A. and Schwartz, S. (1998) ‘Cycle ergometric performance capacity, lactate and respiratory parameters during an intensive training period for endurance athletes’. International Journal of Sports Medicine. 19(Supplement) pp.24-31. Gamble, P. (2013) Strength and conditioning for team sports. 2nd Ed., Oxon: Routledge. Halson, S. and Jeukendrup. (2004) ‘Does overtraining exist? An analysis of overreaching and overtraining research’. Sports Medicine. 34(14) pp. 967-981. Hoffman, J. (2012) NSCA’s guide to program design. Leeds: Human Kinetics. Hooper, A., Mackinnn, L., Howard, A. Gordon, R. and Bachman, A. (1995) ‘Markers for overtraining and recover’. Medicine and Science in Sport and Exercise. 27(2) pp. 106-112. Joyce, D. and Lewindon, D. (2014) High-performance training for sports. Leeds: Human Kinetics. Kellmann, M. (2002) Enhancing recovery: Preventing Underperformance in Atheletes. Leeds: Human Kinetics. Kellmann, M. (2010) ‘Preventing overtraining in athletes in high-intensity sports and stress/recovery monitoring’. Scandinavian Journal of Medicine and Science in Sports. 20(2) pp. 95-102. Kentta, G. and Hassmen, P. (1998) ‘Overtraining and recovery: A conceptual model’. Sports Medicine. 26(1) pp. 1-16. Kindermann, W. (1986) ‘Overtraining: Expression of a disturbed autonomic regulation’. Dtsch Z Sportmed. 37(4) pp. 238-245. Kreher, J. and Schwartz, J. (2012) ‘Overtraining syndrome: A practical guide’. Sports Health. 4(2) pp. 128-138. Lehman, M., Foster, C. and Keul, J. (1993) ‘Overtraining in endurance athletes: A brief review’. Medicine and Science in Sport and Exercise. 25(7) pp. 854-862. Morgan, W., Brown, D., Raglin, E., O’Connor, P. and Ellickson, K. (1987) ‘Psychological monitoring of overtraining and staleness’. British Journal of Sports Medicine. 21(2) pp. 107-114. Morton, R. (1997) ‘Modelling training and overtraining’. Journal of Sports Sciences. 15(3) pp. 335-340. Rearick, M., Creasy, J. and Buriak. (2011) ‘Avoid overtraining in young athletes’. Journal of Physical Education, Recreation and Dance. 82(5) pp. 25-36. Slivka, D., Walther, H., Cuddy, J. and Ruby, B. (2010) ‘Effects of 21 days of intensified training on markers of overtraining’. Journal of Strength and Conditioning Research. 24(10) pp. 2604-12. Stone, M., Keith, R. and Kearney, J. (1991) ‘Overtraining: a review of the signs and symptoms and possible causes’. Journal of Applied Sports Science Research. 5(1) pp. 35-50. Snyder, A., Kuipers, H. and Cheng, B. (1995) ‘ Overtraining following intensified training with normal muscle glycogen’. Medicine and Science in Sport and Exercise. 27(7) pp. 1063-70. Urhausen, A., Gabriel, H. and Weiler, B. (1998) ‘Ergometric and physiological findings during overtraining: a perspective long-term follow up study with endurance athletes’. International Journal of Sports Medicine. 19(2) pp. 114-20. Urhausen, A and Kindermann, W. (2002) ‘Diagnosis of overtraining: What tools do we have?’. Sports Medicine. 32(2) pp. 95-102. Academic article: The potential issues with the use of reflective practice to improve performance.